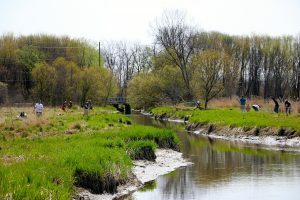 Friends of the Carp River | "Volunteers dedicated to restoring the ribbon of life along the Carp River. " 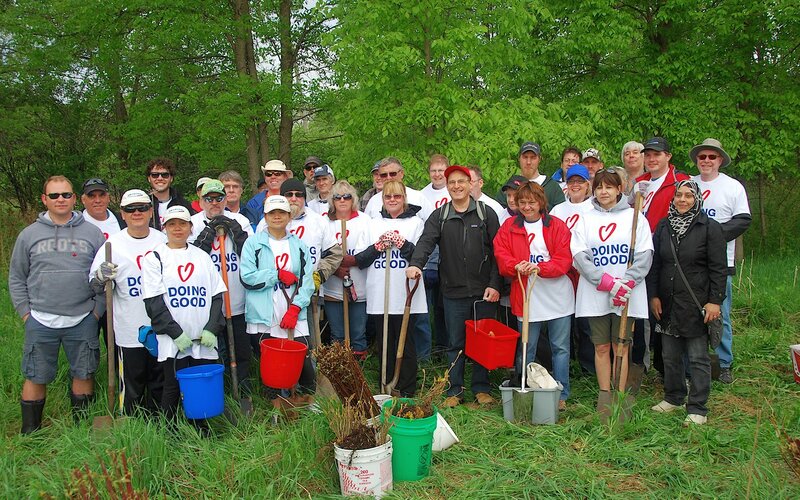 "Volunteers dedicated to restoring the ribbon of life along the Carp River. " 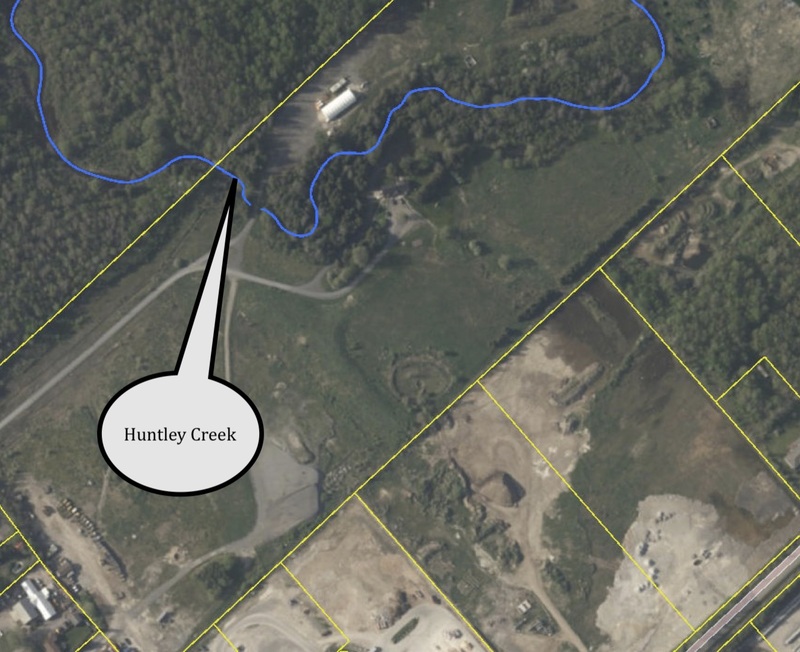 Huntley Creek may be threatened by a Concrete Batch Processing Plant proposed for 2596 Carp Road. Huntley Creek is one of the City’s few cold water creeks and a tributary of the Carp River. Despite setbacks from the floodplain and vegetative buffers, discharge from the plant – planned or unplanned – could affect the creek’s temperature and introduce pollutants. There are also risks to groundwater and nearby wells. The development proposed in the Site Plan application includes a concrete batching plant, site parking, truck parking, outdoor aggregate storage, and an outdoor wash rack. The plant will increase heavy truck traffic on an already congested section of Carp Road. The subject property is currently zoned Rural General Industrial which permits a variety of industrial uses, but does not permit a concrete batching plant. The Zoning By-law Amendment application requests that a concrete batching plant be included as an additional permitted use to the subject property in order to accommodate the development on the property. The target date the application will be considered by the City’s Agricultural and Rural Affaires Committee, is February 7, 2019. Residents are encouraged to voice their concerns to Councillor El-Chantiry and to the City’s planner, who can be contacted via the Site Plan application web site. There are two storm water management ponds. The larger one to the north is 8 ha and it must be built first in 2019/2020 to establish elevation. In Stages 3 and 4, 455 residential units will be built, a mix of singles and townhomes. Stage 3 planned occupancy is 2021; Stage 4 is 2024. There are currently no plans to build Stage 5 (although this may change). It lies in the floodplain and there are “soil challenges”. Feedmill Creek with be “restored” (with developer funds) and pathways created on either side. The work will be done by the City in 2020. The park is 6 ha. Half of the park will be built in 2020/2021; the other half near river will need to be pre-loaded and allowed to settle. The land will need to be raised by 3 to 4 meters. The future LRT corridor is at the south end, between Campeau and the Queensway. It will cross the Carp River and run parallel to Feedmill Creek. Stage 2 is commercial development south of Campeau Drive: 2 hotels, 2 restaurants, and a hotel in 2018/2019. 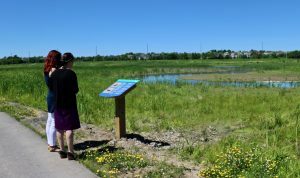 The Carp River restoration site – now called the Carp River Wetland Environment Area – along Terry Fox Drive was officially opened by Councillor Marianne Wilkinson and Mayor Jim Watson. 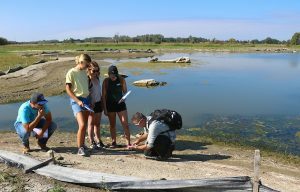 Under an agreement between the City of Ottawa and the Mississippi Valley Conservation Authority (MVCA), the area will become a living classroom for education about wetlands. As a start, the first four interpretive signs have been installed along the beginning of the trail near Arcadia. The sign content was developed by third year Carleton University students taking the group environmental science project course. Together with the Ottawa Stewardship Council we sponsored the Carp River group project. The trails are not finished, but most of the network is complete. You can access them at the end of Campeau Drive from Huntmar Drive. In partnership with the Mississippi Valley Conservation Authority and the Ottawa Stewardship Council, we are supporting the development of a downloaded mobile application for your phone called EcoTrek that will highlight features along the Carp River Restoration site’s pathways as you travel along them. It will draw the visitor’s attention to landmarks, eco-zones, vegetation types, bird and turtle habitat, etc. And it’s set up as a game with points added to your backpack as you learn about the river so that it will appeal to kids, families, and educators. 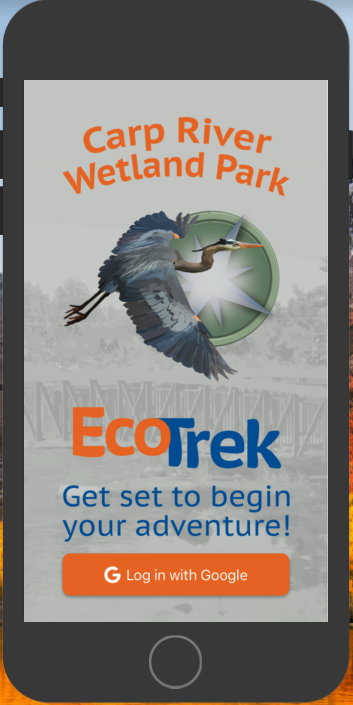 For more information, see the OSC’s EcoTrek article. 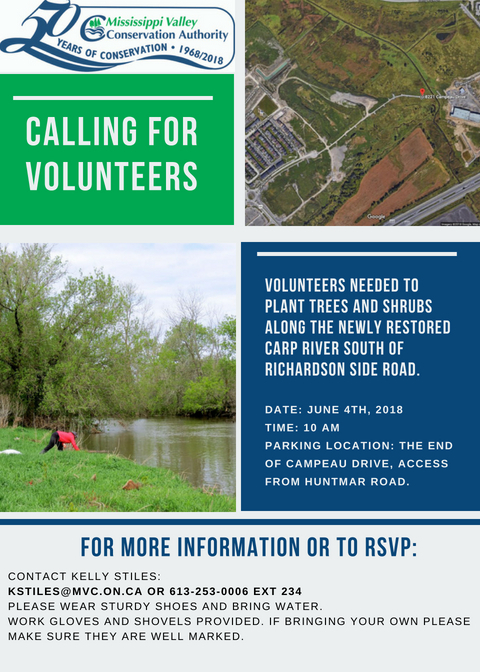 The Mississippi Valley Conservation Authority is planting trees on the Carp River Restoration site in Kanata on Monday, 4 June starting at 10am. 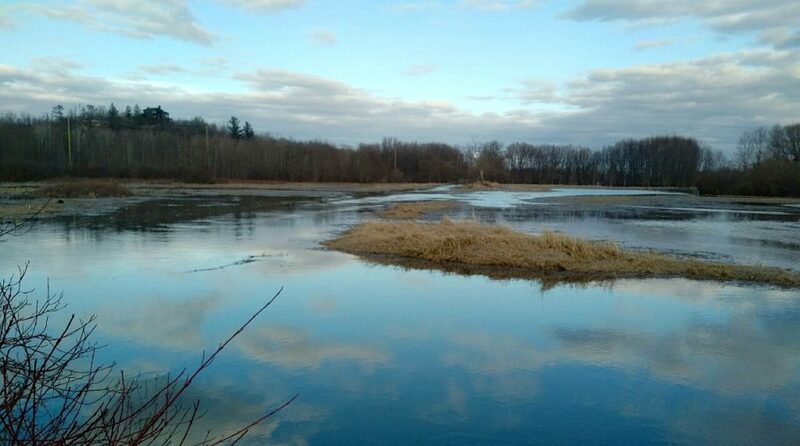 Here’s a beautiful photo by Sue Prior of the Carp River near Huntmar Drive on a tranquil evening. 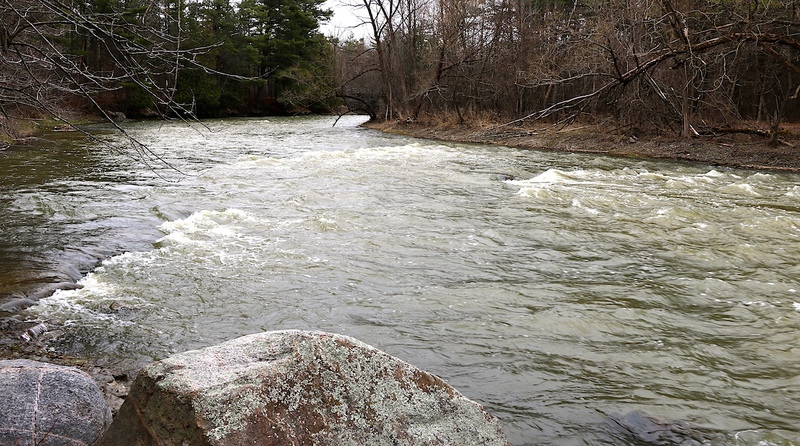 In comparison, here’s the churning river at Fitzroy Provincial Park taken near its mouth where it enters the Ottawa River. 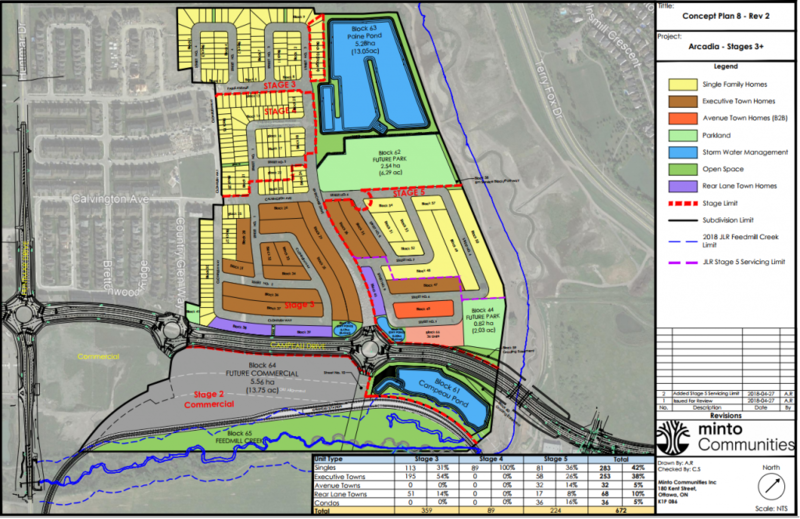 Richcraft Homes held a public information meeting on 12 December to share three preliminary concept plans for the envelope of land – about 27 hectares – available for development out of a total of 77 hectares on the south side of Terry Fox Drive. Information about this project, including past comments from the public, is available at the City of Ottawa’s Urban Expansion Study for the Kanata Highlands. The three concepts can be downloaded here. 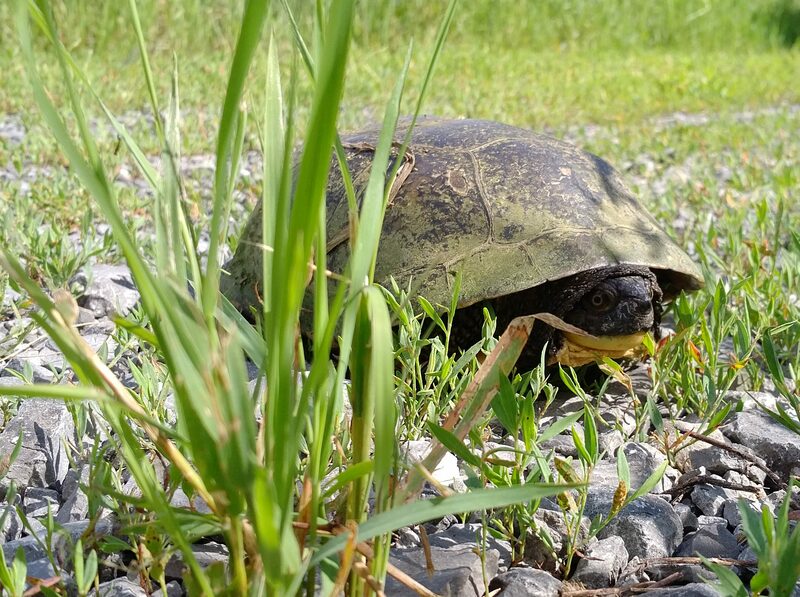 addressing the species at risk on the site, especially the Blanding’s Turtle population. The site borders the stretch of the Carp River between Richardson Side Road and the railroad crossing at Huntmar Road. Flood plain mapping was last done in 1983, but significant development has occurred upstream since that time. Blanding’s Turtles cross the site from the adjacent South March Highlands to reach the river. We sent our comments to the City and you can download them here. engaging schools in nature education programs on the site including building bird and bat boxes, and recording species. The students prepared a short video about the site, which can be viewed in the link below. The view shown in the link is from a point halfway along the restored river, looking north from over the Queensway. Terry Fox Drive is to the right. In 2015, Ducks Unlimited Canada completed a 4 acre wetland restoration along 600 meters of Carp River shoreline at Oakleigh near Huntmar Road. They also constructed a turtle nesting area for the Blanding’s turtles that use the Carp River as a corridor. Blanding’s turtles are a Species at Risk (Threatened status). 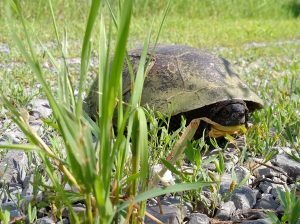 This summer landowner Sue Prior observed this mature Blanding’s turtle on her property. Read about the project in DUC’s October newsletter. In fall 2017 a student team from the Group Research in Environmental Science Project at Carleton University are undertaking a study that will form the basis for monitoring programs and future research projects. 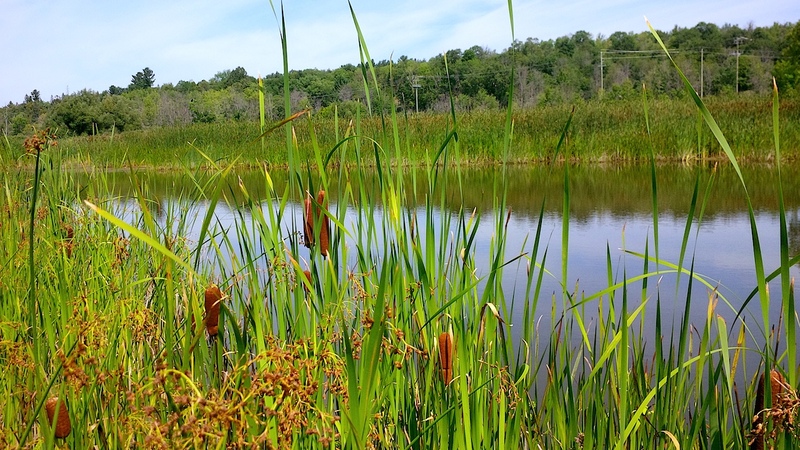 The Carp River Restoration Project commenced in 2016 and incorporates approximately 6000 metres of stream restoration, habitat improvements (ponds and wet meadows), and recreational pathways in a large, rapidly urbanizing area running parallel to Terry Fox Drive in Kanata. 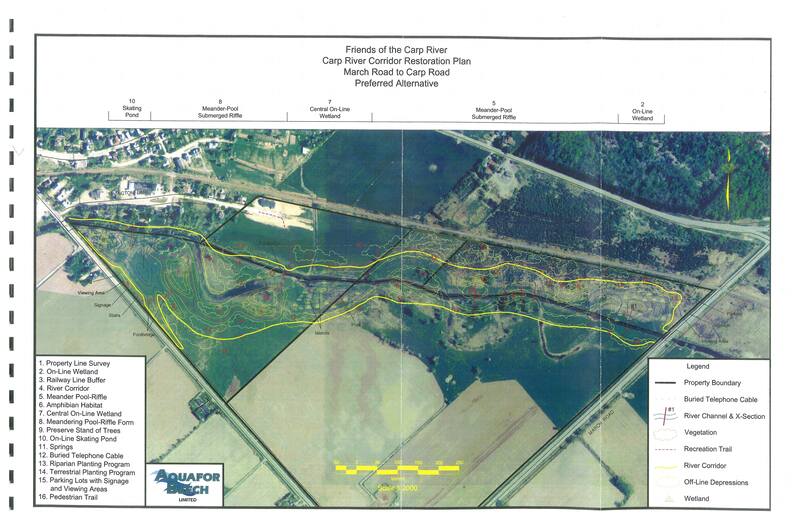 The student’s project will assemble available information about the Carp River before and after the restoration to establish a baseline description of the restored section. 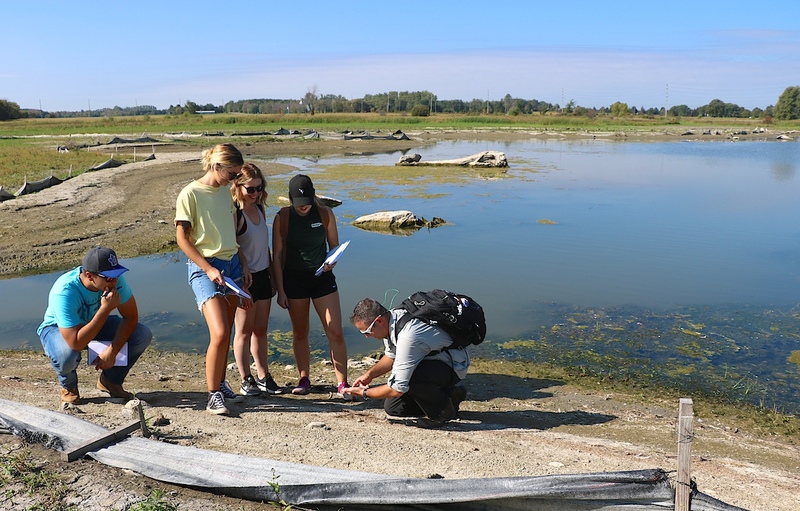 The baseline information and the restoration’s objectives will serve as the foundation on which to base an educational and interpretive program, begin monitoring programs, and conduct research projects related to the efficacy of the restoration. 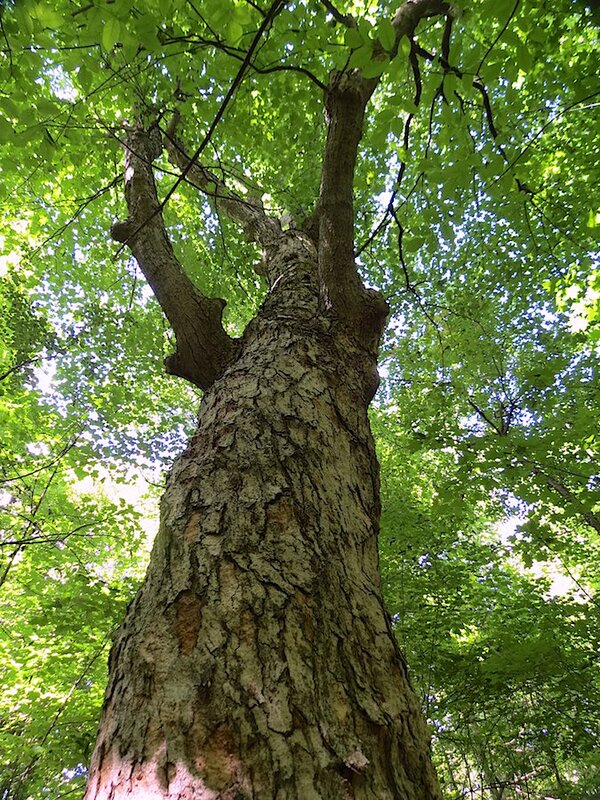 We are partnered with the Ottawa Stewardship Council, who is the lead for the project. 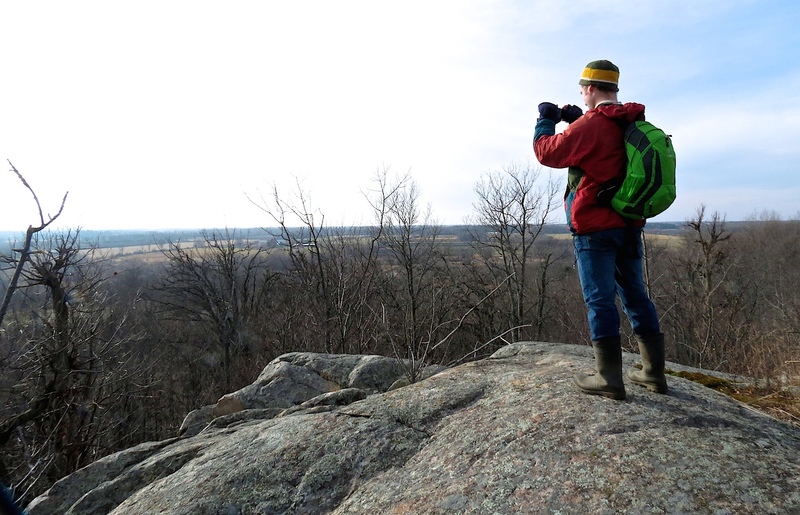 Mississippi Valley Conservation Authority is provided subject matter expertise. What a difference a year makes. Between 22 June and 2 July we received 189 mm (7.5 inches) of rain near the village of Carp. 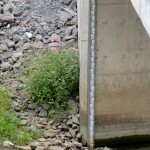 Volunteers have been taking measurements at gauges along the river. 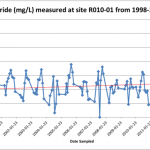 Readings show that the river is at levels consistent with high spring flooding. 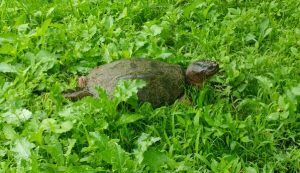 Turtles are looking for dry areas near water to lay their eggs. 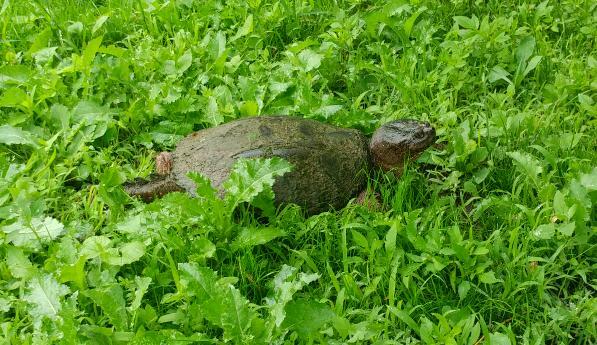 This snapper was photographed by David Dorey on his lawn by the Carp River near Rivington Street in the village. The severe drought has caused extremely low water levels on the Carp River. However, the wetlands at Oakleigh, restored in 2015, are still retaining water. The four ponds have hosted a pair of great blue herons, a king fisher and about a dozen ducks on a daily basis. In the photo below Huntmar Road is in the background by the hydro poles. Photo by S. Prior. The MVCA coordinated the planting of over 550 native trees and shrubs along 600m of the Carp River and its floodplain at the Oakleigh Wetland Restoration site. The trees were planted by employees of local Carp company Senstar, which provides a volunteer day for community work, and by staff from the MVCA. The trees and shrubs will help to stabilize the bank to reduce erosion, provide habitat for wildlife, increase local species bio-diversity, and eventually shade the river to keep it cool with less algal growth. We’re sorry to inform you that we’re cancelling the Canoe the Carp River event on Sunday, 1 May due to very low water levels at the launch area. We are, however, still offering a tour of the Oakleigh Wetland Restoration at 1pm to all registered participants. We’ve had a very dry spring and sunny, dry weather. While the river is deep enough to paddle upstream of the March Road bridge, the launch site has wide mud flats and low mid-channel clearance for boats. We’ve had two test paddlers in last 24 hours report low water levels and mucky conditions. There are no other easily accessible public launch sites in the area, something that we’re working on changing in the future. We appreciate the interest and enthusiasm of those who signed up to participate. We had 50 boats registered and had to turn some people away. We’ll try again next year! 1 May 2016 – Second Launch Time. We have a very limited area in which to launch boats. All 25 boat spaces for our 10:00 am launch have sold out. We want as many people as possible to join us, so we are offering a second launch window at 10:30 am with 25 spaces available. You can register on-line at: Eventbrite – Second Launch. We have run out of boats to lend people, so you must have your own boat. 1 May 2016 – You’re Invited to Canoe the Beautiful Carp River! 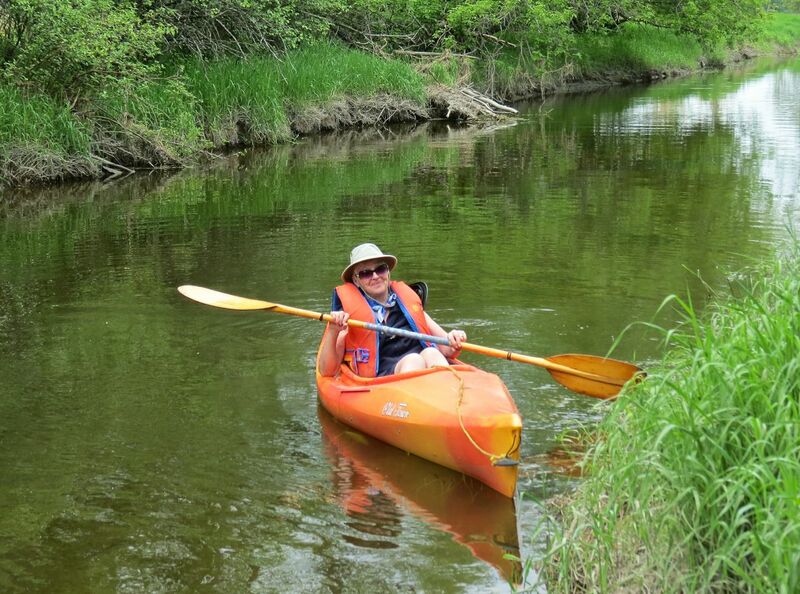 The Friends of the Carp River, Mississippi Valley Conservation Authority, and Trailhead Paddle Shack are inviting the community to join them to “Canoe the Carp River” this spring. The event will be held on Sunday, 1 May between 10 am and 3 pm rain or shine. Boats will be launched at Carp Road and Rivington Street by the bridge in Carp. We will paddle upstream as far as Huntmar Road and then return to Carp, a round trip distance of 11 km, which will take approximately 3 hours at a leisurely pace. Pre-registration is required at Eventbrite. 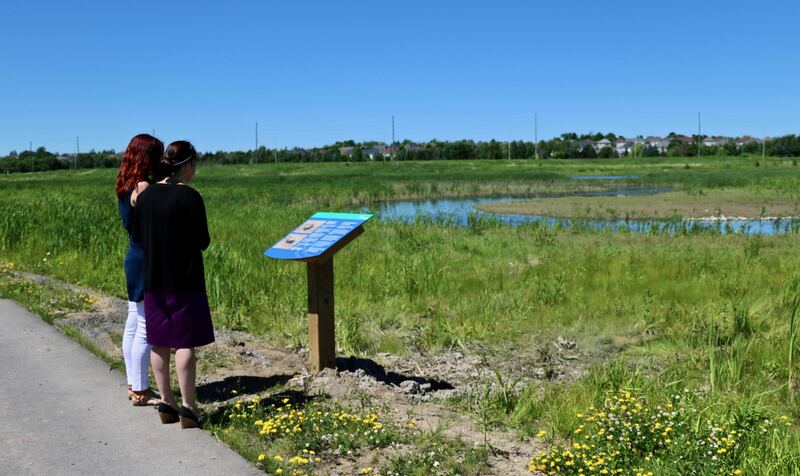 Boaters will have the opportunity to take a tour of the Oakleigh Wetland Restoration project near the Huntmar Bridge, where there will be refreshments and bathroom facilities. You are encouraged to bring your own canoe or kayak. Canoes and kayaks will also be available on site, compliments of the Trailhead Paddle Shack, for those who need them. If you do need a boat, please email us separately after you’ve registered your ticket. Participants must register ahead of time on Eventbrite and sign a waiver. We plan to launch at 1000 am so please arrive between 0930 am and 0950 am. A donation of $10 per boat is requested to support the Friends of the Carp River. Parking is at the Tubman Funeral Home parking lot at 115 Rivington Street in Carp. One ticket per boat. Once you have your ticket, please download and print the waiver. One waiver per participant. Sign it and either scan it and email it or bring it with you to the launch. Warning: There may be downed trees in the river and you may have to portage your boat around these on muddy and wet banks. Wear waterproof boots and clothes that can get dirty. Delayed to Tuesday, 10 May at 7:30pm at St. Paul’s Church in Dunrobin. The Dunrobin Women’s Institute is thrilled to be hosting Sue Prior, who will be speaking about her Oakleigh Wetland Restoration project and ideas for the future. This is a public meeting and all people are welcome. Tea and treats will be served near the end of the meeting. 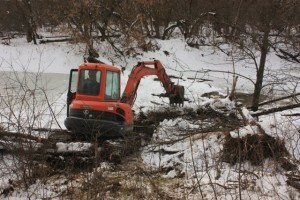 Work has begun on the Carp River Restoration Project between Hazeldean Road and Richardson Side Road. The sculpting of ponds and wet meadows is clearly visible when driving along Terry Fox just south of Richardson Side Road. 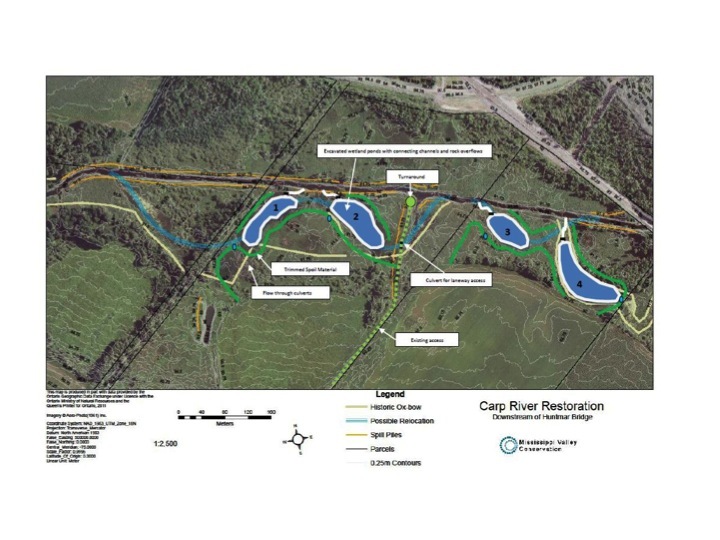 The West Carleton Review published a good summary article in their 21 January 2016 edition: Carp River Restoration Begins After Years of Study. Councillor Qadri has also provided a summary: Carp River Restoration Project Update. The Friends of the Carp River will have a table and display at the Celebrate the Hills event being held on Sunday, 13 September between 10:30am and 3:30pm at 150 Donald B. Munro Drive. 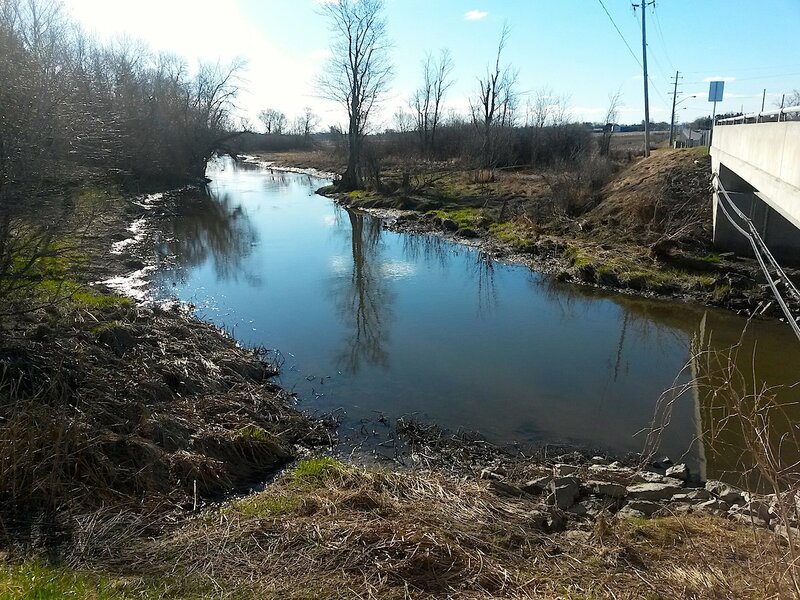 Learn more about the Carp River Remediation Project in planning for a section of the river near the village. See Celebrate the Hills for more information. 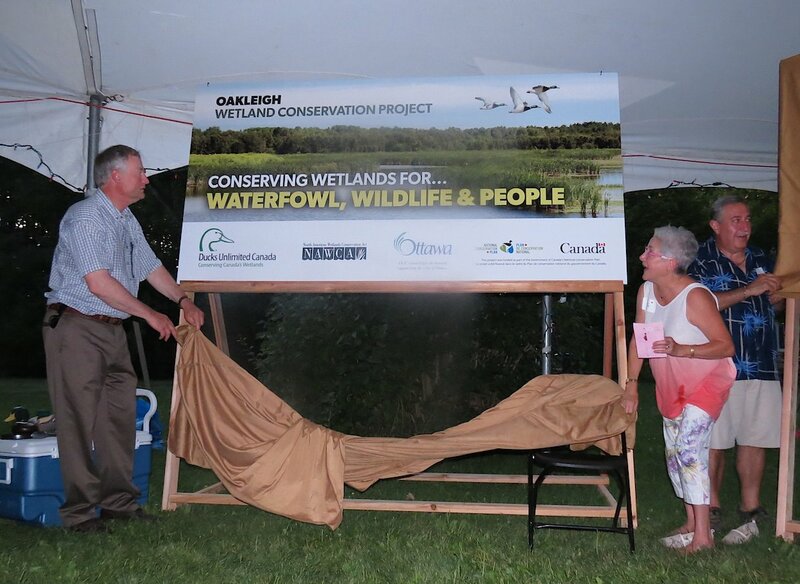 Jamie Fortune, Chief Operating Officer of Ducks Unlimited Canada, and Sue Prior, landowner, unveil one of two new signs that will mark the wetland restoration project at Oakleigh on the Carp River. Things were hopping at Oakleigh as hundreds of young leopard frogs cleared the trails for tours of the new wetlands by the guests at the BBQ and celebration. The pond vegetation is filling in nicely. For recent photos, see the Oakleigh Wetland Restoration Photo Gallery. 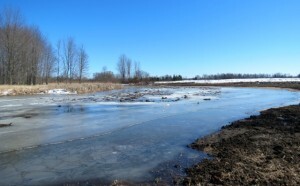 Landowner Sue Prior is thrilled with the outcome of the wetland restoration project undertaken by Ducks Unlimited Canada on her 0.6 km stretch along the Carp River. The wetlands were constructed in the winter of 2015. Waterfowl, frogs, and other wetland creatures are populating the area as the vegetation fills in. Sue is opening her Oakleigh Wetlands Restoration Project to the public BY APPOINTMENT ONLY at this time. 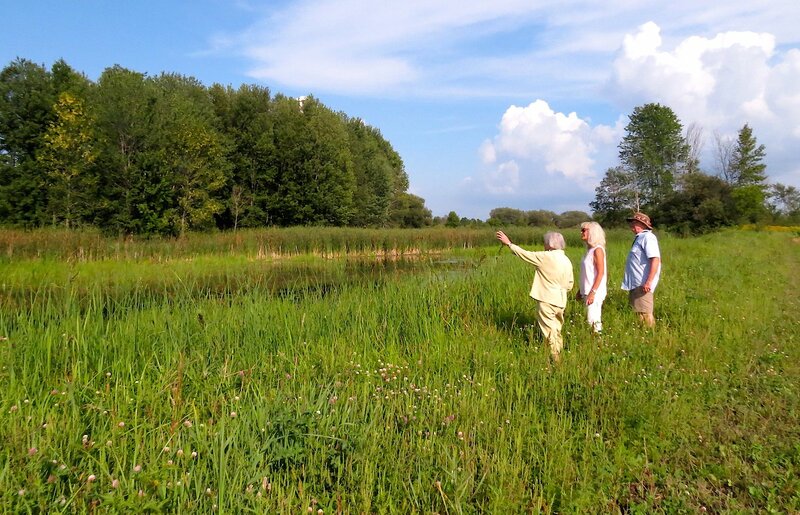 If you have a group – be they gardeners, bird watchers, river folk, or just plain nature deprived city dwellers – who would like to see the initial stages of a large wetland restoration, contact her via our Contact form. Sue is particularly interested in working with special needs groups and encourages them to connect with her to share ideas. Public events are being planned in the future to showcase the project and hopefully encourage other landowners along the river to consider enhancing their wetlands. Contact Caleb Yee at the MVCA for details: Cyee@mvc.on.ca, 613-253-0006, ext 253. 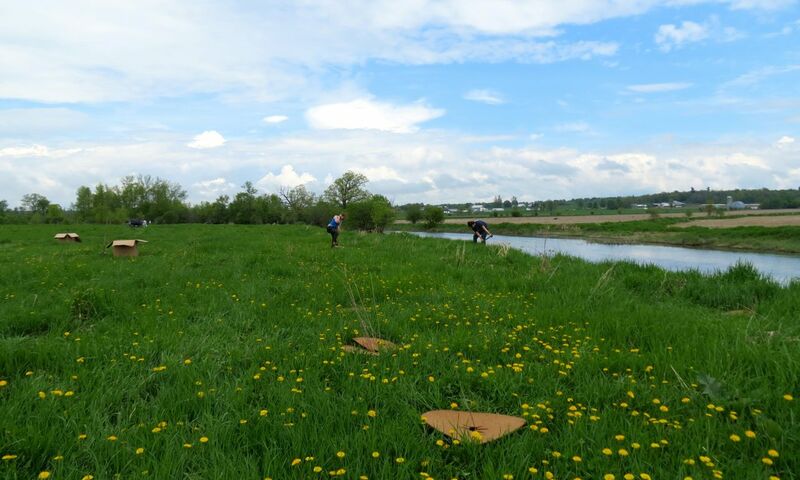 Vitesse Reskilling Canada organized the planting of over 800 trees along the Carp River at the Diefenbunker. Volunteers from local company Senstar planted the trees under the direction of Caleb Yee from the MVCA. Funding was provided by the Great Lakes Guardian Community Fund. Cancelled due to low water levels caused by a very dry spring. 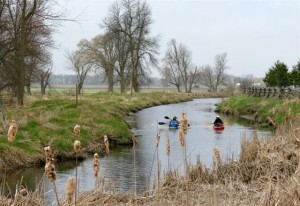 The Friends of the Carp River and the Mississippi Valley Conservation Authority are once again inviting the community to join them to “Canoe the Carp River” this spring. 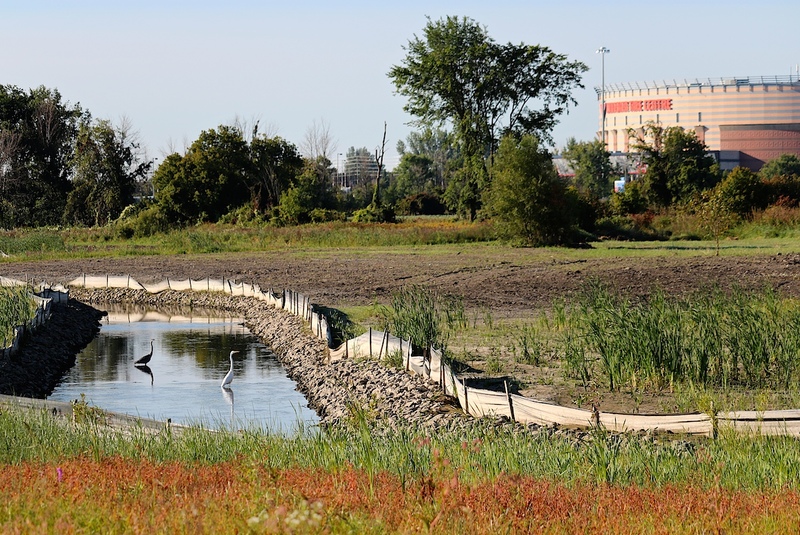 Ducks Unlimited Canada has completed construction of the four wetland ponds along a 600m stretch of the Carp River near the Huntmar bridge. 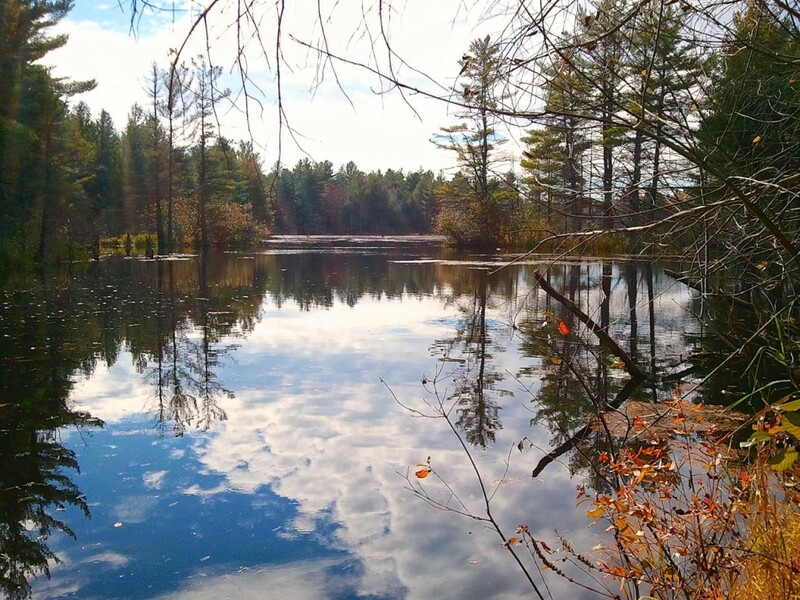 Each pond is connected to the river through a rocky outlet channel, which will allow the ebb and flow of water and encourage the passage of both fish and wildlife species. 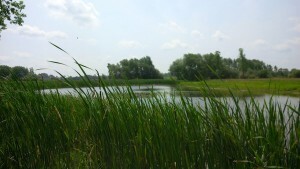 The four ponds were created in existing wetland basins comprising a 4 acre area. The basins were excavated to extend their period of hydration and re-contoured to encourage the establishment of productive, permanent wetland habitat. A turtle nesting area was also created to support the existing population. The project was initiated and led by the landowner, who wanted to restore the natural functioning of the land, which had been degraded through historical dredging and straightening of the river. The area will now be left to revegetate naturally, with a mature wetland habitat expected by fall of 2016. One of the main goals of the Carp River Action Plan is moving forward. 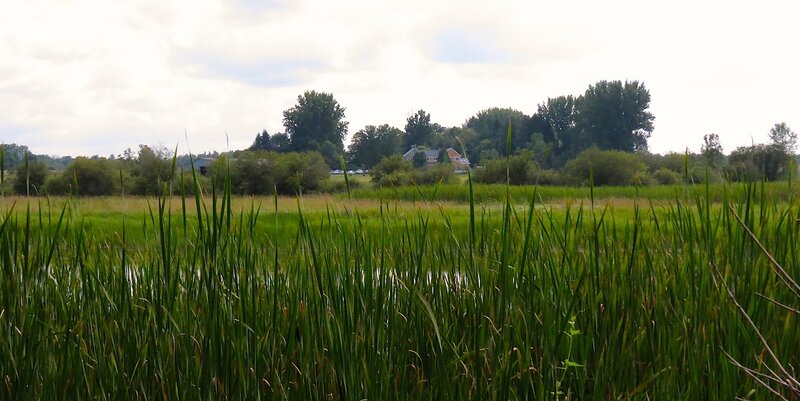 Ducks Unlimited Canada has obtained $500K of funding needed to undertake a major wetland restoration and habitat creation project along 0.6km of privately-owned river front downstream from Richardson Side Road. Key support from Councillor El-Chantiry secured 50% of the funding from the City’s Environmental Resource Area Acquisition Reserve Fund. Check out the interview with the landowner in the West Carleton Review’s 1 January 2015 article: Portion of Carp River to be Restored, by Jessica Cunha. Does 1 inch of rain equal a 1 foot rise in the Carp River? Since August of 2012, volunteers have been monitoring rain fall and water level at 6 locations along the length of the Carp River. The data are sent to the MVCA for analysis to correlate rain fall with the rise and fall of the Carp River. 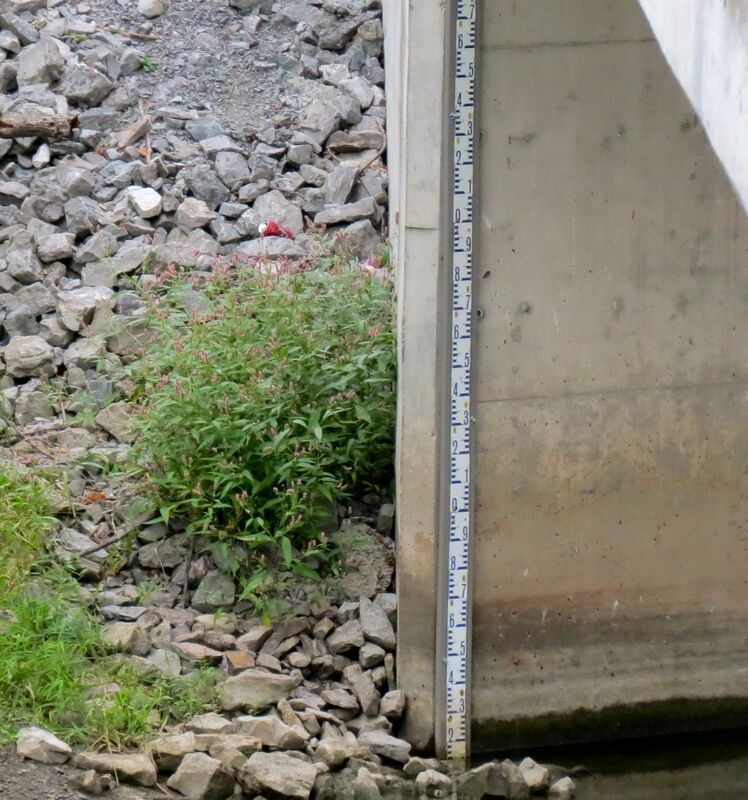 Data from volunteers are integrated with data from three MVCA flow gauges in the river, which are located at Maple Grove in Kanata, Richardson Side Road, and Kinburn. The maximum annual flow has been decreasing. This correlates with less snow melt. The mean annual flow has decreased slightly. The maximum summer flow has been increasing, likely due to more frequent and larger summer storms. Mean summer flows are increasing. While a trend in higher temperatures should lead to more evapotranspiration, it is believed that summer flow rates are higher due to more hard surfaces upstream. The minimum summer 7-day mean flow has been increasing. For more information, go to our Carp River Monitoring page. 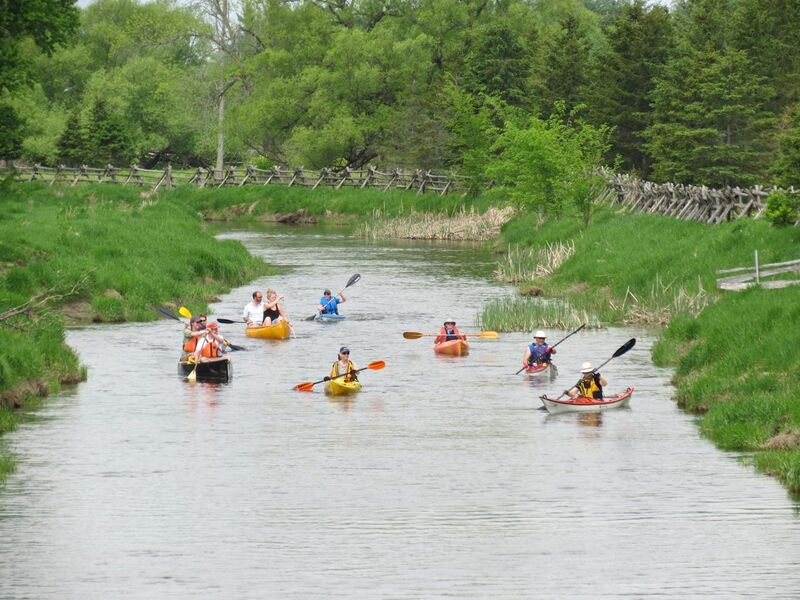 May 2014 – Canoe the Carp River Event a Success! The Friends of the Carp River and the Mississippi Valley Conservation Authority (MVCA) hosted 10 boats and 20 people in their “Canoe the Carp River” event on 25 May. The event was held to introduce people to the natural beauty of the Carp River, which is the only river to lie entirely within the City of Ottawa. 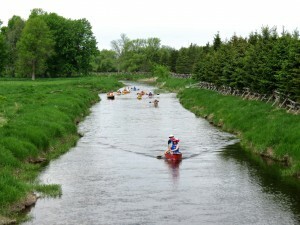 Canoes and kayaks launched at the village and paddled upstream to the Huntmar Bridge, returning to Carp for a round trip distance of about 11 km. Boaters saw natural areas and wildlife along the route: forests, wetlands, a turtle, muskrat, and herons. Also visible was evidence of past dredging in the straightened channels and high banks, and runoff from pastures and fields without plants on the river bank to buffer it. Thank you to Karson Kartage for use of their portapotty, to Tubman Funeral Home for use of their parking lot, and to Sue P. for refreshments. 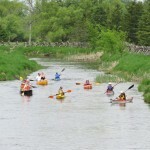 The West Carleton Review published an article about our event: Friends Paddle the Carp River. Read West Carleton Review reporter Derek Dunn’s comical account of his “race” down the river with fellow paddlers: Sojourn Along the Might Carp Definitely Not a Race. 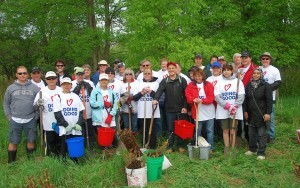 Volunteers and staff from the MVCA planted over 1000 trees and shrubs along the Carp River and one of its tributaries. Funding for the trees was provided through the Ottawa Stewardship Council’s Carp River Green Banks program. 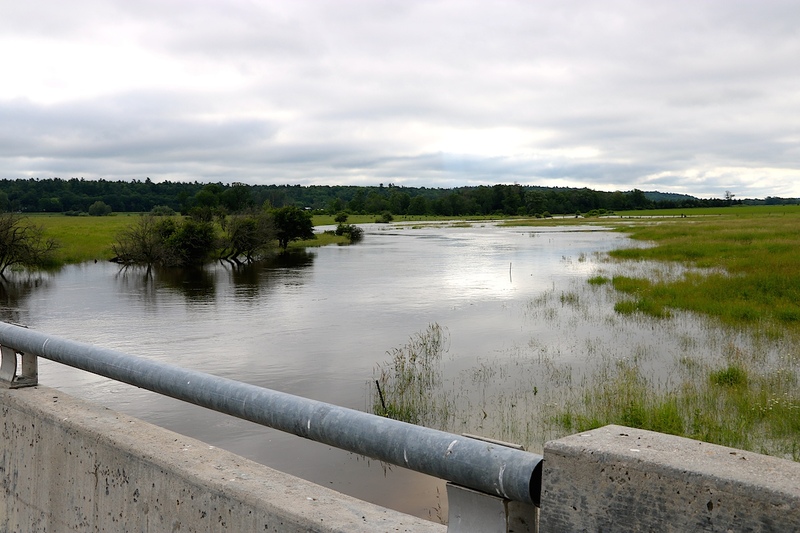 The expected impacts of this project include filtering agricultural runoff from entering the Carp River and stabilizing the banks to prevent further erosion. Both of these issues contribute to poor water quality. The shrubs/trees planted will also create new habitat for wildlife with food and shelter. Trees and shrubs were also planted in the Craig Side Road area where blockages were removed in the fall. The Mississippi Valley Conservation Authority is running a City Stream Watch Program on Huntley Creek this spring and needs volunteers help to complete it. Huntley Creek flows from Highway 7 east of Upper Dwyer Hill Road to the Carp River (North of Richardson Side Road). The program will run from June 9, 2014 (Monday –Saturday) until June 27, 2014. During the assessment volunteers will work closely with experienced staff members to survey the creek. Wearing hip waders, a group will wade up the creek taking detailed measurements and site characteristics every 100m. Each group will consist of 2-3 volunteers and 1-2 staff members. The stream survey will run from 9am-3pm, which includes meeting at the site, training, putting equipment on, hiking to the creek and completing the survey. Why: To engage individuals of the local community while at the same time collecting valuable monitoring data which can be used to create restoration plans. The schedule is based on what days volunteers are available. This program offers excellent hands-on and educational experience while at the same time giving you a chance to meet new people and give back to nature! The Mississippi Valley Conservation Authority (MVCA) is selling rain barrels to raise funds to support their Stream Watch programs. $10 from the purchase of each rain barrel will help the MVCA meet their water monitoring goals in the Carp River and Mississippi River watersheds. Rain barrels capture and store rainwater collected from roofs through downspouts. They provide chlorine-free and fluoride-free water that is ideal for flowers, vegetables, lawns, shrubs and trees. It will save you money and help you conserve this precious resource. Volunteers will be needed at the pick-up points to help with loading the barrels. Contact Suzanne Mcfarlane at 613.253.0006 ext. 225 if you’d like to help. 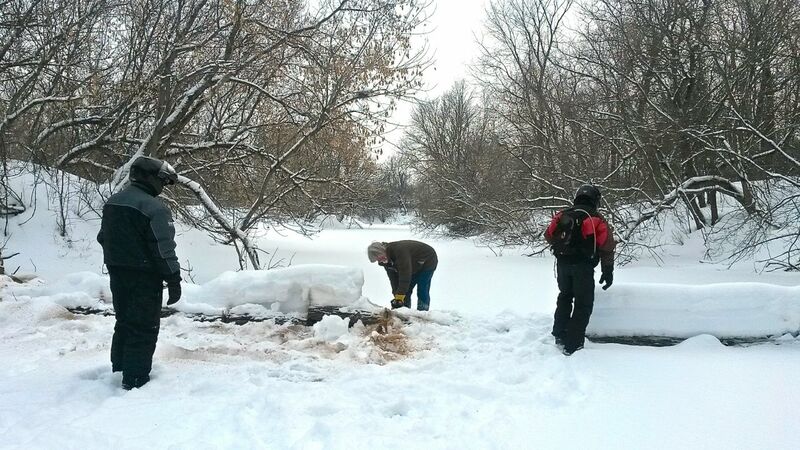 The Friends and members of the West Carleton Snow Mobile Club cleared downed trees and branches behind the Diefenbunker and near Craig Side Road to improve canoe and kayak passage. Only debris above the water line was removed in order not to disturb fish habitat. We also cleared some trees near the village of Kinburn. The Mississippi Valley Conservation Authority (MVCA) has completed removal of three barriers across the Carp River at two sites just downstream from the Village of Carp. The project is in partnership with the City of Ottawa, the Friends of the Carp River (FCR), shoreline landowners, and with funding from the Department of Fisheries and Oceans (DFO). 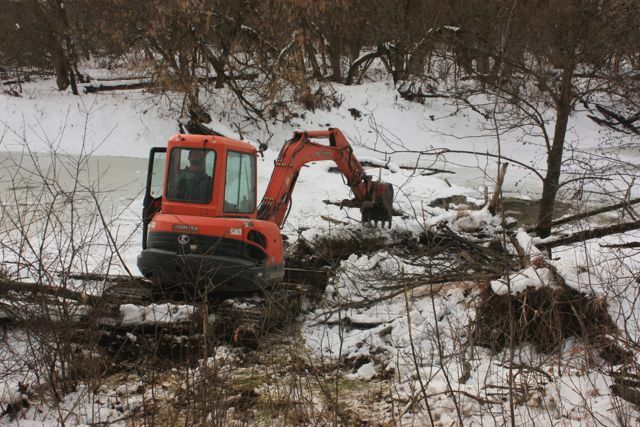 A tree jam was opened up and two abandoned farm crossings were removed as they can cause high flow velocities making it difficult for fish to migrate upstream to spring breeding grounds. The structures can also cause ice jams creating flooding and erosion problems as the water creates a new path downstream. Now that the structures are removed, approximately 150 m of shoreline will be planted with local native trees and shrubs helping to restore the banks from historical cattle access and the disturbance caused when removing the bridge structures. 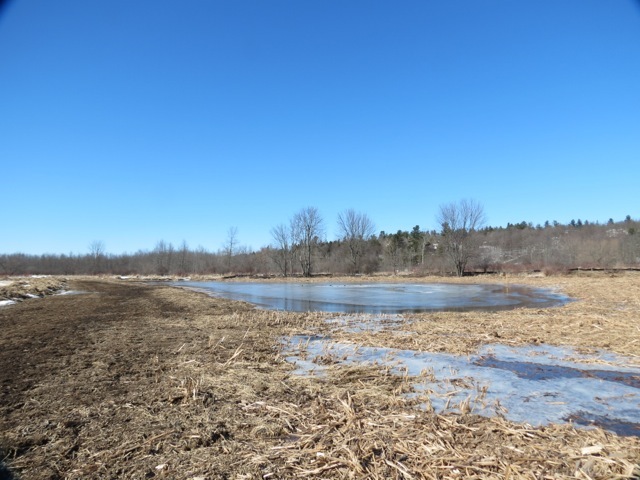 This restoration is just one of the projects that the MVCA and the FCR plan complete over the next few years along the Carp River and its tributaries. If you are a shoreline resident and interested in participating in these stewardship activities, MVCA staff can help get you started. These projects are important to the quality of the Carp River; funds are available to provide advice, materials, and labour for your shoreline project. If you have any questions about the rehabilitation or want more information about private landowner projects, contact Kelly at the MVCA office 613-253-0006 or kstiles@mvc.on.ca. 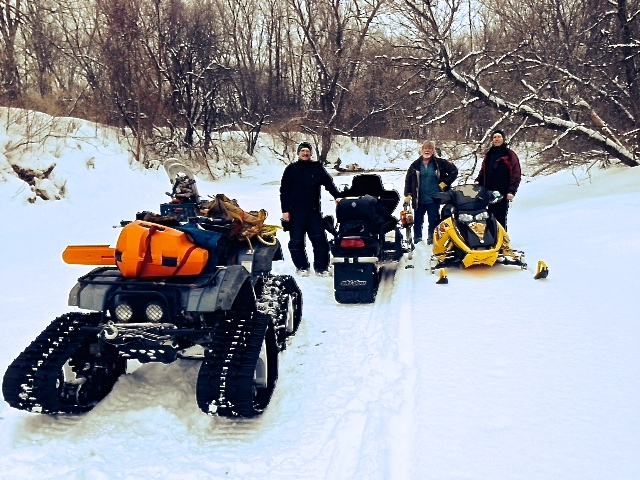 Copyright © 2014 Friends of the Carp River.